The most important day of your lives together should be celebrated forever. 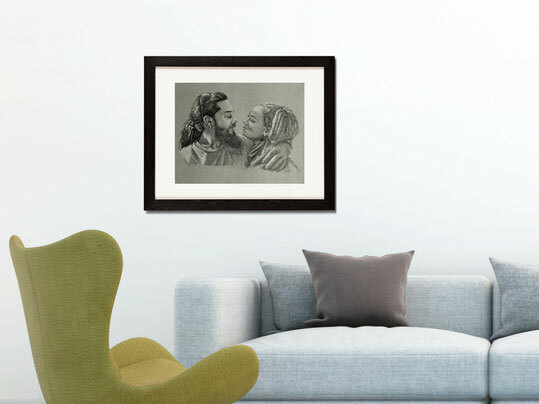 What better way than to admire a unique wedding portrait drawing in the home where your love continues to grow every day? Have a portrait drawn of the most beautiful aspects of your wedding! Chest length portraits detail the happy smile or delightful kiss from that perfect day. Highlighting the physical symbol of your shared love can make a very poignant piece for your wall. A great way to show off the crisp and carefully crafted bride and groom ensemble. It's a shame this perfect outfit can only be worn once! Here's a great way to admire it daily. A sophisticated yet traditional view of the beautiful bride looking angelic on her big day. Since the wedding dress can be a work of art in itself, this option is a great way to let your style shine all on its own. Since the whole family rarely gets together as much as they should, this is a perfect time to commemorate the folks who have loved and supported you from the start. Surprise the happy couple with a portrait or a gift certificate memorializing their special day for many years to come. Show your best friends just how much you appreciate their help with your special day by surprising them with a gift certificate or custom portrait of them looking their loveliest.